Q: According to reports, China and Russia distributed a draft press statement by the President of the UN Security Council on politically resolving the Korean Peninsula issue to other Council members. Can you confirm this and why did China take this action? A: Recently, the situation on the Korean Peninsula has witnessed positive changes. Such development accords with China's consistent position on the Korean Peninsula issue, conforms to the relevant resolutions of the UN Security Council and serves the common interests of all parties. 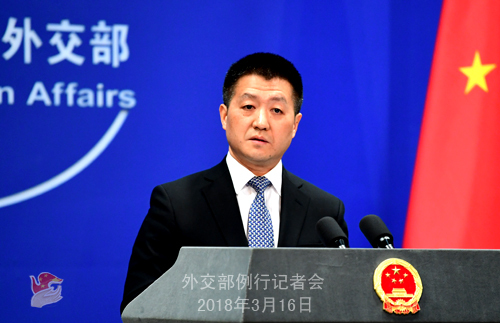 China believes that in light of the latest development of the situation, the UN Security Council need to send out some positive signals to further encourage and support dialogues and talks. 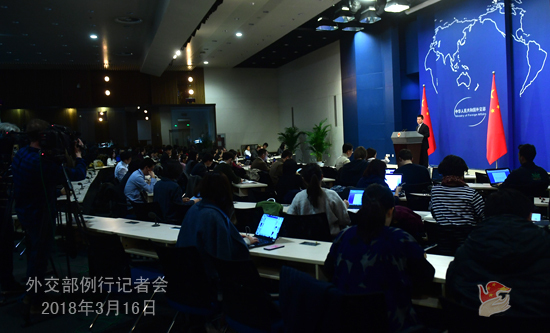 With such considerations in mind, China proposed to the Security Council to issue a press statement by its President, and together with Russia, we distributed a draft statement to other members. The draft statement is mainly about recognizing the positive changes on the Korean Peninsula, supporting the amelioration of inter-Korean relations, and welcoming the proposed talks and interactions between the US and the DPRK. It also stresses the goal of realizing denuclearization of the Korean Peninsula and maintaining its peace and stability and reaffirms the commitment to supporting the Six-Party Talks. Q: Reports say that Choe Kang-il, the deputy director general of the DPRK Foreign Ministry is now in Beijing to promote DPRK-US contacts. Do you have any information on that? A: I am not aware of the situation. Q: A follow-up question about the press statement. It was also reported that it was blocked by the United States. I wonder if you have any comment to that? A: I believe you know our position on this. We always believe that the Korean Peninsula nuclear issue should be resolved through political, diplomatic and peaceful means, which also represents a broad consensus shared by the UN Security Council members. The draft press statement has the support of the vast majority of the UN Security Council members. Q: Djibouti's Finance Minister Ilyas Dawaleh said that Djibouti's government will embrace greater Chinese involvement in the nation's ports and sees no reasons for US concern that "its strategic interests may be threatened". What is your comment? A: We all know what prompted the Djibouti's Finance Minister to say this. The evaluation on China-Djibouti cooperation made by the Djibouti side is objective and fair which also echoes the voice of most African people. In recent years, China-Djibouti cooperation in various fields has brought tangible benefits to the two peoples and made important contributions to regional peace and stability. We have noted that some people in the US have been playing such tunes as "its strategic interests being threatened" and there are also reports alleging that the Doraleh Container Terminal is controlled by China. These claims are not without ulterior motives. The Djibouti government has made it clear in its recent statements that "Djibouti is an open economy and ports cooperation is a commercial act where Djibouti has diverse partners. No country can develop itself without having a strong infrastructure, and China is, from that perspective, a very good partner". We believe that the relevant side should lend their ears to these African voices. We welcome efforts from all parties of the international community to help Africa grow its economy and realize development and prosperity. For the relevant side, we hope that it could choose to make positive contributions to our concerted efforts for peace, stability and prosperity of Africa. Q: According to reports, the US government has said that it has yet to decide whether to go ahead and sign the Taiwan Travel Act. But the bill could automatically become law on Saturday. I would like to ask if that does become a US law, how would China respond? A: We have made clear our position on this issue many times. I bet even if I don't repeat it, you already know by heart the position of the Chinese government. The relevant clauses of the act mentioned by you, though not legally binding, still severely violate the one-China principle and the three joint communiqués between China and the US. China is strongly dissatisfied with that and also firmly opposes it. We have lodged stern representations with the US side. I must reiterate that the one-China principle is the political foundation of the China-US relationship. 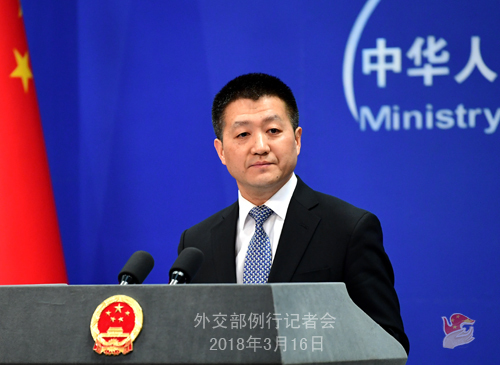 We urge the US side to adhere to the one-China policy and honor the commitments it made in the three joint communiqués, stop pursuing any official ties with Taiwan or improving its current relations with Taiwan in any substantive way. It must handle Taiwan-related issues properly and cautiously so as to avoid causing any major disruption or damage to the China-US relations. Q: According to the ROK media, China will send a special envoy to the DPRK to discuss the inter-Korean and DPRK-US talks. Can you confirm this? As I said before, regarding the Korean Peninsula situation, relevant parties have been engaging in active dialogues and interactions, which we believe represents a positive momentum worthy of our support and encouragement. We also hope that all relevant parties of the international community could offer their best support. Q: On March 15, the British government issued its latest biannual report on Hong Kong. What is your comment? A: It seems that Britain needs to be reminded every six months that Hong Kong affairs are China's domestic affairs in which the British side has no right, nor any chance, to interfere. By issuing this so-call biannual report which makes unwarranted comments on Hong Kong affairs, the British government wanted to showcase its influence. But it was a waste of time and energy and will only be detested by the Chinese people. Q: It is reported that Indonesia is trying to hold joint patrols in the South China Sea with other ASEAN countries. What is your response? A: I haven't seen such information released by the Indonesian side officially. With the concerted efforts of China and ASEAN countries, the South China Sea situation is stable and getting better. You may also know that China and ASEAN countries are working together to implement the DOC and launch COC consultations. What I know is that China and ASEAN countries are all committed to maintaining this region's peace, stability, development and prosperity, something that we hope could have the respect and support of all non-regional countries. Q: According to reports, on March 15, Thomas J. Donohue, the President of the US Chamber of Commerce issued a statement, saying that tariffs are damaging taxes on American consumers. He also mentioned that tariffs of another 30 billion dollars which the US government is considering on commodities imported from China every year would wipe out most of the savings American families received from the government tax deduction and may lead to a destructive trade war. What is your comment on this? A: I have noted Mr. Donohue's remarks. In fact, recently, a growing number of clear-eyed people in the United States have made their voice of reason heard on China-US economic relations. As I said yesterday, the China-US economic cooperation has opened up huge market and created a large number of jobs for our two sides. The truth is that US trade with China has considerably lowered American families' per capita spending burden. I also want to say that if China-US economic cooperation only benefited China lopsidedly, then I honestly don't believe that China-US economic relations could have gone this far. As we always say, there are no winners in a trade war, as it will harm every side including the initiator. No side shall take its chances and choose to believe that it will emerge intact. That is one thing I can say for sure. It is normal for China and the United States, the world's top two economies with interests highly intertwined, to have some differences and frictions in our economic cooperation. What matters is that we should manage them in a constructive manner and properly address each other's major concerns by making the pie of our cooperation bigger so as to ensure the sound and steady development of bilateral economic relations. Q: According to reports, a cyber security firm Fire Eye Inc says that Chinese hackers have launched a new wave of attacks on US engineering companies linked to the South China Sea issue. Can you confirm these reports and do you have any comment on this? A: China firmly opposes and cracks down on all forms of cyber-attacks. We will not allow any country or individual to engage in such illegal activities as cyber-attacks on the Chinese soil or by capitalizing on China's infrastructure. China and the United States have important common interests in safeguarding cybersecurity. We will continue to implement the important consensus on cybersecurity reached with the US in 2015, make good use of the existing cyber dialogue mechanisms, and step up cybersecurity cooperation. Meanwhile, we hope that the US could make concerted efforts with China on the basis of mutual respect to advance the relevant cooperation.